Micro Channel architecture, or the Micro Channel bus, was a proprietary 16- or 32-bit parallel computer bus introduced by IBM in 1987 which was used on PS/2 and other computers until the mid-1990s. Its name is commonly abbreviated as "MCA", although not by IBM. In IBM products, it superseded the ISA bus and was itself subsequently superseded by the PCI bus architecture. The development of Micro Channel was driven by both technical and business pressures. A limited number of interrupts, fixed in hardware. A limited number of I/O device addresses, also fixed in hardware. Hardwired and complex configuration with no conflict resolution. Poor grounding and power distribution. Undocumented bus interface standards that varied between systems and manufacturers. These limitations became more serious as the range of tasks and peripherals, and the number of manufacturers for IBM PC-compatibles, grew. IBM was already investigating the use of RISC processors in desktop machines, and could, in theory, save considerable money if a single well-documented bus could be used across their entire computer lineup. It was thought that by creating a new standard, IBM would regain control of standards via the required licensing. As patents can take three years or more to be granted, however, only those relating to ISA could be licensed when Micro Channel was announced. Patents on important Micro Channel features, such as Plug and Play automatic configuration, were not granted to IBM until after PCI had replaced Micro Channel in the marketplace. The Micro Channel architecture was designed by engineer Chet Heath. A lot of the Micro Channel cards that were developed used the CHIPS P82C612 MCA interface controller; allowing MCA implementations to become a lot easier. 16-bit Network Interface Card IBM 83X9648. 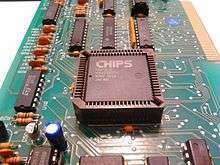 The Micro Channel was primarily a 32-bit bus, but the system also supported a 16-bit mode designed to lower the cost of connectors and logic in Intel-based machines like the IBM PS/2. The situation was never that simple, however, as both the 32-bit and 16-bit versions initially had a number of additional optional connectors for memory cards which resulted in a huge number of physically incompatible cards for bus attached memory. In time, memory moved to the CPU's local bus, thereby eliminating the problem. On the upside, signal quality was greatly improved as Micro Channel added ground and power pins and arranged the pins to minimize interference; a ground or a supply was thereby located within 3 pins of every signal. Another connector extension was included for graphics cards. This extension was used for analog output from the video card, which was then routed through the system board to the system's own monitor output. The advantage of this was that Micro Channel system boards could have a basic VGA or MCGA graphics system on board, and higher level graphics (XGA or other accelerator cards) could then share the same port. The add-on cards were then able to be free of 'legacy' VGA modes, making use of the on-board graphics system when needed, and allowing a single system board connector for graphics that could be upgraded. Micro Channel cards also featured a unique, 16-bit software-readable ID, which formed the basis of an early plug and play system. The BIOS and/or OS can read IDs, compare against a list of known cards, and perform automatic system configuration to suit. This led to boot failures whereby an older BIOS would not recognize a newer card, causing an error at startup. In turn, this required IBM to release updated Reference Disks (The CMOS Setup Utility) on a regular basis. A fairly complete list of known IDs is available (see External links section). To accompany these reference disks were ADF files which were read by setup which in turn provided configuration information for the card. The ADF was a simple text file, containing information about the card's memory addressing and interrupts. Although MCA cards cost nearly double the price of comparable non-MCA cards, the marketing stressed that it was simple for any user to upgrade or add more cards to their PC, thus saving the considerable expense of a technician. In this critical area, Micro Channel architecture's biggest advantage was also its greatest disadvantage, and one of the major reasons for its demise. To add a new card (video, printer, memory, network, modem, etc.) the user simply plugged in the MCA card and inserted a customized floppy disk (that came with the PC) to blend the new card into the original hardware automatically, rather than bringing in an expensive trained technician who could manually make all the needed changes. All choices for interrupts (an often perplexing problem) and other changes were accomplished automatically by the PC reading the old configuration from the floppy disk, which made necessary changes in software, then wrote the new configuration to the floppy disk. In practice, however, this meant that the user must keep that same floppy disk matched to that PC. For a small company with a few PCs, this was annoying, but practical. But for large organizations with hundreds or even thousands of PCs, permanently matching each PC with its own floppy disk was logistically unlikely or impossible. Without the original, updated floppy disk, no changes could be made to the PC's cards. After this experience repeated itself thousands of times, business leaders realized their dream scenario for upgrade simplicity didn't work in the corporate world, and they sought a better process. The basic data rate of the Micro Channel was increased from ISA's 8 MHz to 10 MHz. This may have been a modest increase in terms of clock rate, but the greater bus width, coupled with a dedicated bus controller that utilized burst mode transfers, meant that effective throughput was up to five times higher than ISA. For faster transfers the address bus could be reused for data, further increasing the effective width of the bus. Around 40 MB/s of throughput was observed (the theoretical maximum for MCA was 66 MB/s), although some higher throughput functions of the Micro Channel bus were not initially supported on cards operating on an Intel platform. With bus mastering, each card could talk to another directly. This allowed performance that was independent of the CPU. One potential drawback of multi-master design was the possible collisions when more than one card would try to bus master, but Micro Channel included an arbitration feature to correct for these situations, and also allowed a master to use a burst-mode. Micro Channel cards had complete control for up to 12 milliseconds. This was long enough to permit the maximum number of other devices on the bus to buffer inbound data from over-runnable devices like tape and communications. Multiple bus-master support and improved arbitration means that several such devices could coexist and share the system bus. Micro Channel bus-master-capable devices can even use the bus to talk directly to each other (peer to peer) at speeds faster than the system CPU, without any other system intervention. In theory, Micro Channel architecture systems could be expanded, like mainframes, with only the addition of intelligent masters, without periodic need to upgrade the central processor. Arbitration enhancement ensures better system throughput, since control is passed more efficiently. Advanced interrupt handling refers to the use of level sensitive interrupts to handle system requests. Rather than a dedicated interrupt line, several lines can be shared to provide more possible interrupts, addressing the ISA-bus interrupt line conflict problems. All interrupt request signals were "public" on Micro Channel architecture permitting any card on the bus to function as an I/O processor for direct service of I/O device interrupts. ISA had limited all such processing to just the system's CPU. Likewise, bus master request and grant signals were public, such that bus attached devices could monitor latency to control internal buffering for I/O processors. These features were not adopted for PCI, requiring all I/O support to come uniquely from the system board processor. Micro Channel architecture was first introduced at the launch of the PS/2 range in 1987, with three out of the four of the new machines featuring it. Its use in IBM spread to the RS/6000, AS/400, and eventually to the IBM 9370 systems - smallest members of the System/370 range. IBM licensed the architecture to other companies for one to five percent of revenue. NCR Corporation adopted Micro Channel comprehensively - they designed and built high-performance personal computer, workstation and server platforms supporting it, including their own Micro Channel architecture-based logic componentry, including SCSI, graphics, networking, and audio. A small number of other manufacturers, including Apricot, Dell, Tandy, Research Machines and Olivetti adopted it, but only for part of their PC range. Despite the fact that MCA was a huge technical improvement over ISA, it soon became clear that its introduction and marketing by IBM was poorly handled. IBM had strong patents on Micro Channel architecture system features, and required Micro Channel system manufacturers to pay a licence fee - and actively pursued patents to block third parties from selling unlicensed implementations of it. The PC clone market did not want to pay royalties to IBM in order to use this new technology, and stayed largely with the 16-bit AT bus, (embraced and renamed as ISA to avoid IBM's "AT" trademark) and manual configuration, although the VESA Local Bus was briefly popular for Intel '486 machines. For servers the technical limitations of the old ISA were too great, and in late 1988 the "Gang of Nine", led by Compaq, announced a rival high performance bus - Extended Industry Standard Architecture (EISA). This offered similar performance benefits to Micro Channel, but with twin advantage of being able to accept older ISA boards, and being free from IBM's control. For several years EISA and Micro Channel battled it out in the server arena, but in 1996 IBM effectively conceded defeat when they themselves produced some EISA bus servers. Within a few years of its arrival in 1992, PCI had largely superseded Micro Channel, EISA and VESA. Expansion cards for the Micro Channel bus typically targeted high-end graphic workstation or server requirements, with SCSI, Token ring, Ethernet, IBM 5250 and IBM 3270 connections. ↑ Use of the ISA bus outside of machines employing the 80x86 cpu family was rare. Notable non-x86 hardware that used the ISA bus include the IBM RT/PC, BeBox, some Apollo/Domain workstations, and some members of the Digital Equipment AlphaServer line. ↑ "IBM PC Server 520 -- New 166MHz SMP Models and Feature Enhancements". IBM. June 18, 1996. Retrieved 2010-01-31.